We're taking the drone approach to covering Photokina 2016. No boots on the ground but aerial surveillance of the more important targets. We'll provide a brief description with links to official press releases and sponsored links for pre-ordering. This entry covers new Arca-Swiss products and Kevin Raber's continuing coverage of Days Two and Three. The new Canon bayonet lens board mounts Canon lenses onto the entire range of Arca-Swiss 6x9 cameras and has full electronic adjustment of aperture settings. The focal length and aperture setting of the lens is displayed on a bright OLED display built into the lens board. Two buttons on the lens board change aperture up or down in 1/3 steps. Pressing both buttons simultaneously will fully open or close the lens to the selected aperture. Using mirrorless full frame cameras like the Sony A7/A7RII mounted on the rear standard of the view camera, lateral and vertical movements can be adjusted on the rear standard of the camera within the image circle of the Canon lens. 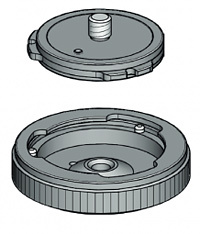 Canon T/S lenses will allow movements of up to 12mm in each direction without moving the lens. Development of the patented C1 Cube and D4 has been refined with a gear driven self-locking pan device situated underneath the camera quick release for secure and precise positioning. The new versions will be designated "gp" for geared panning control. You now have a choice when panning an image: gear driven or free movement. When the gp knob is pulled out, the pan movement is free for coarse and quick panning adjustments. When the gp knob is pushed in, the gears inside the panning device are re-engaged and will offer precision geared rotation of the camera. 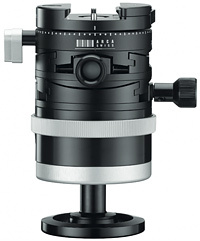 Both heads are also equipped with a second manual panning control at the base of the head for positioning the head on the tripod. 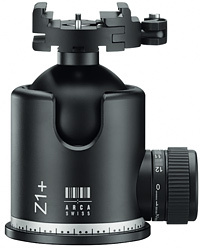 Arca-Swiss is now offering a new version of the compact and lightweight p0 tripod head in a hybrid design with the simplicity of the original p0 monoball and the geared precision of the C1 Cube. The new p0 tripod heads have an aspherical ball and a patented locking mechanism based on three planetary locking elements. 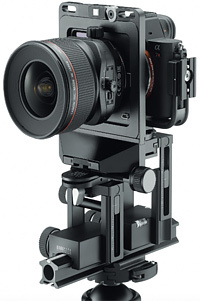 These locking elements apply uniform force around the ball ensuring smooth movements of the camera in any axis. Above the head's locking mechanism, there are now integrated two self-locking, geared segments, each of which can precisely adjust up to a range of plus or minus 10° in the X or Y axes. This allows you to adjust or level the camera coarsely with the ball-head using the p0 locking ring and then fine-tune the camera position precisely in both axes using the MicroMetric gear driven knobs. Additionally, if the nodal point is adjusted for, there will be virtually no change in the distance to the subject that can be seen in the viewfinder or display. After the alignment and leveling of the camera, a panoramic swivel device placed above the two axes, allows for a completely level rotation of 360°, with no further adjustment of the camera required. Despite its new hybrid design, the p0 hybrid tripod head weighs just 1.1 lbs. Combining a breach mount receiver for the tripod along with a tripod head base plate, the Quiklink makes attaching and removing your tripod head from your tripod fast and easy. Installation is simple and once installed, it can remain in place. Thread the Quicklink mount receiver to the top of your tripod. Next, attach the Quicklink head connecting plate to the base of your tripod head using the supplied wrench. Once both components are mounted, drop the tripod head into the tripod receiver mount and rotate the knurled locking ring clockwise until snug. To unlink, turn the knurled ring counter clockwise and lift the head to remove. The Monoball Z1+, like the Z2+ and Z1g+, now has a Motion Related Gravity Control system, a variable bi-directional drag system which operates independently on both axes but is stabilized in all directions. With horizontal movements, the friction setting of the ball head remains the same, whereas vertical movements take advantage of the aspherical ball which leads to a progressive increase of the friction as the camera and lens is tipped forward or back. This increase makes the ball head the safest available with no flopping around! The new Monoball Z1+ is available in single pan (sp) or double pan (dp) models. Using the dp top pan, level the spirit level on the quick release and Z1+ dp will allow perfect horizontal panning irrespective of the tripod placement. Kevin Raber covers Photokina 2016 Day Two and Three, which leaves one more day. "Photokina is half the size of what it was ten years ago," he laments. "And, a lot smaller than the last one, only two years ago." He covers Canon and Nikon and some intriguing camera bags, plus a few otherwise ignored accessories. But again it's his perspective as a long-time attendee that is particularly valuable (and which we haven't found elsewhere).